What Is A Good Cost-Per-Click (CPC)? Social media and search platforms are changing the advertising game. In 2016, one-third of all advertising spend will go towards digital channels, and with over 80% of all digital marketing dollars going towards display ads and search advertising, understanding the proper metrics to execute an effective online advertising campaign is critical. In this post, we’re going to cover cost-per-click. The short answer is “it depends.” Cost per click can vary greatly due to a variety of factors. These factors include the platform on which you’re advertising, the type of advertising you’re using, the audience you’re targeting, the product or service you’re advertising, and your bidding strategy. The more detailed answer, which is covered in this post, is targeting a cost-per-click that achieves your desired return-on-investment, or ROI. Your ideal cost-per-click will be determined by your target ROI, or return-on-investment. For most businesses, a 5:1 revenue-to-ad ratio is considered acceptable. This means for every dollar spent in advertising, five dollars in revenue is produced. A 20% cost-per-acquisition, or CPA, is another way of expressing this ratio. Bonus resource: If a 5:1 revenue to ad spend ratio is too expensive, use these methods to cross sell existing customers online. This will increase average customer value, which in turns increases how much you can spend to acquire a new customer. For those advertising on search engines, the product or service being advertised is the single greatest contributor to cost-per-click. Most online ad platforms are auction based. Advertisers determine how much they’re willing to pay for each click, and those who are willing to pay more get their ads placed higher on the page or are more likely to be shown in a newsfeed. The more expensive your product or service, the more your competitors are willing to pay for the click. For example, if you sell a $20,000 product, and your website and sales team can convert one out of every 200 ad clicks into a sale (a .5% conversion rate), you should be willing to pay $20 per click on your ad. This results in paying $4,000 in ad costs to acquire a $20,000 sale (there's that 5:1 ratio mentioned earlier). Companies selling less expensive products cannot afford such expensive advertising costs. For example, if your product sells for $200, and you convert one out of every fifty ad clicks into a sale, you should target a CPC of $.80. Fifty clicks at $.80 each generates one sale worth $200, so your $40 investment would have achieved the 5:1 ratio. 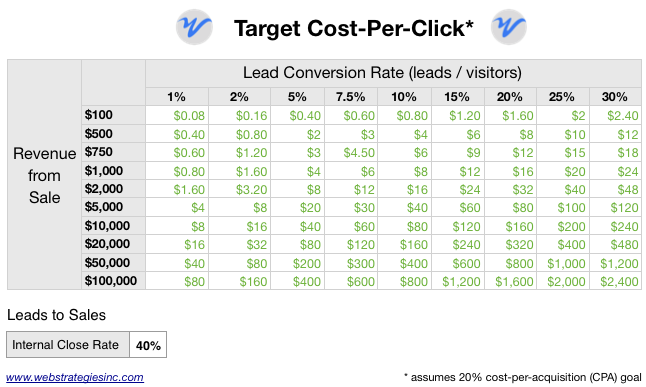 The following chart shows several scenarios for determining your target cost-per-click, taking into account revenue per sale and your website's conversion rate. Most websites, especially B2B websites, don’t sell directly online. Instead, they provide a form, application, or phone number for visitors to fill out, which then feeds to a sales team. To calculate your target cost-per-click under this scenario, you simply need to factor in your internal close rate to the formula above (or the rate your sales team turns website leads into new customers). The chart below assumes a 40% average close rate. 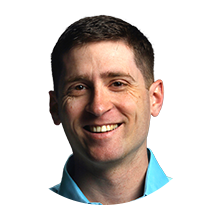 In other words, your sales team is able to turn four out of every ten leads produced on your site into new business. Related source: Is Paid Search Engine Marketing an Effective Strategy for B2B? Lifetime value considers the full value of a customer over their entire life. To calculate this value, you must consider how much business they’ll refer to you and any repeat business that may occur. This increases their value beyond their first purchase, and thus increases the amount you’re willing to pay to acquire them. A high customer lifetime value may justify a very high CPA on their first purchase. Some businesses may be willing to break even or sell at a loss during the first transaction. If you’re going to advertise with these tight margins initially, be confident in your calculation for lifetime value. In summary, a good cost-per-click is determined by your target ROI. For most businesses, a 20% cost-per-acquisition, or 5:1 ratio of revenue to ad cost, would be acceptable. From there, use the formulas provided above to determine the target cost-per-click for your advertising campaigns.